Children’s Librarians all over the world understand how important picture books in both traditional and digital formats are for children: for their development, their cultural identity, as a springboard into learning to read for themselves; for their visual skills, and because of the closeness of sharing them with an adult. It is then very important to promote picture books and to ensure access to them. 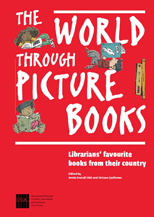 The idea behind the World Through Picture Books is to create a list of picture books from around the world that have been recommended by librarians, as a tool for building bridges and developing understanding between countries. The project is led by IFLA Children’s and Young Adults section with support from partners IFLA Literacy and Reading section and IBBY (International Board on Books for Young People). Edited by Annie Everall and Viviana Quiñones. The Hague, IFLA Headquarters, 2013. - 140p. 30 cm. Order directly from IFLA Headquarters (address on order form) for EUR 26 per report, plus 18.00 postage and handling charges and VAT, if applicable.